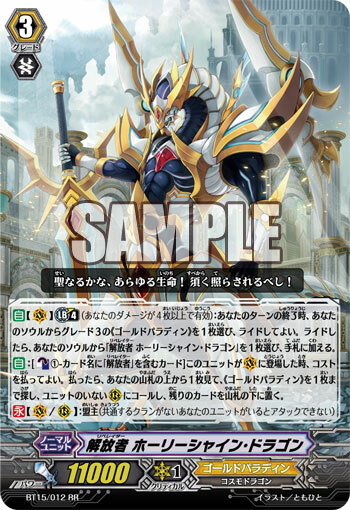 [AUTO](VC) Limit Break 4 (This ability is active if you have four or more damage):At the end of your turn, choose one grade 3 «Gold Paladin» from your soul, and you may ride it. If you do, choose one card named "Liberator, Holy Shine Dragon" from your soul, and put it into your hand. [AUTO]:[Counter Blast (1)-card with "Liberator" in its card name] When this unit is placed on (VC), you may pay the cost. If you do, look at the top card of your deck, search for up to one «Gold Paladin», call it to an open (RC), and put the rest on the bottom of your deck. "Every life is holy and sacred! Thou shalt be illuminated!" A skilled draconic soldier commongly known as the “Light Dragon Knight” who directly serves under the King of Knights as one of his bodyguards. No matter the ocassion, no matter his fow, he possesses a code of noble-minded chivalry that leads him to fight the enemy fair and square no matter what. He was found by, and previously served as a boydguard of, the previous King, and also served as the stewart of the young king “Alfred”. As a result, he’s one of the few knights who is able offer advice to the King with hestitating. As well, without judging the to-be-Hero named “Blaster Blade” like others did, he merely viewed the future hero as another knight whose duty was to protect the king, and gave him tolerating glances. He’s the kind of guy who believes that if the many would be saved if he gave up his own body, he’d gladly expose himself to the line of fire without a moment’s hesitation. He is a truly strong knight, for while he has incredibly power, he does not rely on power alone. While he hopes for victory, he does not demand it. What he desires is the Future. Tomorrow. That at after he wins a battle, there will be a peaceful world awaiting everyone. The Dragon of Light stands today on the battlefield as the king’s shiled, and as Cray’s sword. The general term for those chosen from the second standing army of United Sanctuary, “The Gold Paladins”, they are the few that the King of Knights has entrusted with the mission of protecting not only the Sanctuary, but the entire world of Cray. They were named the “Liberators” because they liberate all who have been ensnared by the schemes of the wicked. Those with the title are said to be the guiding hand of the new era. At the center of the group are the young warriors who saved the day, known as the “Gold Paladins”, but some of their number are battle-scarred veterans who were handpicked for the job. Break ride looping seems chill.